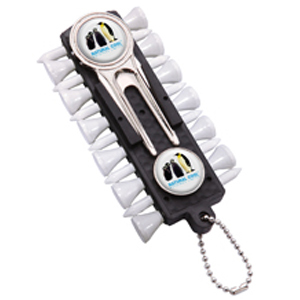 One metal fork and one metal marker both printed and domed to your design in a rubber tee bar with twelve plain white wooden tees, one plain pencil with an eraser and a silver chain for attachment to golf bag. Dimensions : 110mm x 54mm. Print Areas : 22mm diameter.